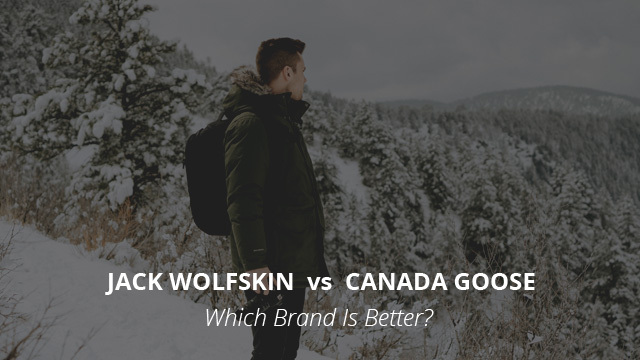 Jack Wolfskin vs Canada Goose: Which Brand Is Better? We have done it all when it comes to comparisons. Be it jackets, fabric technologies, materials and even brands, all grounds have been covered in our comparison reviews. It has been a while since our last brand comparison, so we are back at it again today. We will take a look at Jack Wolfskin and Canada Goose to see how they compare to each other in quality, materials used and price, as well as quickly go through some of their most popular jacket designs. Neither of these brands are newcomers as their jackets have been included in many of our selections, reviews and comparisons. Without any further ado let’s get right into it. Jack Wolfskin was founded in 1981 in Frankfurt, Germany, by Ulrich Dausien and its headquarters currently reside in Idstein, Germany. It began its journey as a trademark of Sine company and later was sold to Johnson Outdoors, in 1991. Up until then, the brand was only available for retail in specialist stores and then in 1993 its own shop was opened. Since then, the brand quickly grew in popularity and the demand increased not solely in Germany but also from other countries and continents, such as Asia and South America. Currently there are 900 Jack Wolfskin stores worldwide, most of which are located in China. The reason this brand is considered as one of the biggest outdoor suppliers in Germany is because of their product designs, which not only perform beautifully, but their style is appealing to both outdoor enthusiasts as well as those who are looking for casual apparel. Their product range is not solely limited to jackets and clothing, but includes footwear, sleeping bags, tents and rucksacks as well. A similarity between Jack Wolfskin and Canada Goose is their corporate responsibility, as Jack Wolfskin is a member of the Fair Wear Foundation, the aim of which is to improve the working conditions in the textile industry. They were graded into the second best category for their workplace environment by the NGO Erklärung von Bern. Not just that, but Jack Wolfskin is also part of the I.C.E Youth Camp for youth training, as well as being part of the “Rebound” project. This project’s purpose is to improve the life of former Ugandan child soldiers, helping them reintegrate into society. With our focus being on jackets, we will be taking a look at the fabrics used by Jack Wolfskin in their jackets, so as to have a better comparison point between the two brands. The majority of their jackets are made of Polyester as the base material, which is sourced from recycling previously used polyester, which in turn reduces the environmental impact of the brand. The way they design and then manufacture their jackets is more comfort and protection oriented rather than solely focusing on physical performance. While they do an outstanding job for avid sportsmen and sportswomen, the comfort of their apparel and jackets is why they are a popular choice among those that are solely looking for a casual, day-to-day jacket. In considering their materials, we will look at them in two parts: the fabric technology used and the insulation, as there is quite a bit to go through. First, the main fabric technologies used by the brand are Texapore and Texapore Air. These consist of a Polyester shell which is DWR-treated for water repellency. The DWR finish is free of PFC, further minimizing the damage to nature. This shell is then bonded to a waterproof PU membrane on the inside, or PU coating, depending on the construction, which can be 2, 2.5 and 3-layer. A smooth inner lining is also part of the construction, which then results in a waterproof, windproof and breathable fabric. The difference between the two is the microporous PU coating or membrane in Texapore Air. These micropores make air permeability possible, which increases with movement, referred to as “dynamic breathability”. These are hardshell fabrics, with a basic water column rating of 15.000mm and up and a minimal breathability rating of 15.000 g/m2/24h, which categorizes them as both highly waterproof and breathable, along with being windproof, too. Now let’s move on to the different insulators that are used for the jackets and apparel. Beginning with Down, their ratio ranges between 90/10 and 80/20, the highest number indicating the amount of down feathers used. This down is sourced from humanely-treated ducks and geese, which are neither live plucked nor force-fed. The second insulator is Downfiber, a mix of 70% down and 30% Fibercloud. Fibercloud is a synthetic insulation consisting of hollow micro fibres, which is great at heat retention and fast-drying. This combination provides the loft of down with the moisture-resistance of the Fibercloud, using it as a backup in case the down gets wet, since synthetic insulators manage to retain warmth despite getting wet, unlike down. Lastly, Microguard is also a synthetic fiber insulation, which is similar to fleece and does not require quilting. It consists of tangled polyester fibres and comes in different thicknesses for providing different levels of warmth and loft, such as Maxloft and Silver that is great at heat reflection due to the metallic particles. The jacket we have picked comes in both male and female versions and it’s the Troposphere design. Troposphere’s main selling point is the ability to retain warmth well, without being too bulky. This is due to the Downfiber insulation, consisting of 70% down and 30% Fibercloud fibers, along with Microguard. The insulation is coated with DWR, adding to the moisture-resistance, without affecting the jacket’s ability to breathe. It’s fully windproof and waterproof, made of Texapore O2 fabric. It’s a versatile design that can be worn casually as well as for sports such as skiing or fishing in freezing temperatures. 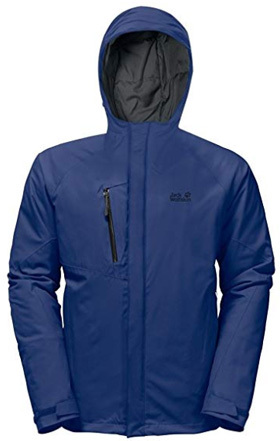 Price-wise, this is not the cheapest brand as most of the jackets are priced upwards of $100, the ones made of down usually priced more than that. Quality-wise these jackets are well-made and perform very well, which isn’t necessarily always the case with expensive jackets. However, as high-end brands go, Jack Wolfskin is slightly more affordable than some other options. One of the most renowned brands worldwide, Canada Goose was founded in 1957, formerly known as Metro Sportswear Ltd. The name Canada Goose came to be after the brand branched into the European market. While the high quality of their jackets, which are considered to be an investment rather than just a purchase, because they last for decades, is the main reason why the brand is so popular, there are other factors at play also. The main one being celebrity endorsement, and also sponsorship for movie crews, such as the cast of Game of Thrones or in the James Bond movies with Daniel Craig. We have taken a very detailed look at how the brand came to be, so we would suggest you take a look at that article if you’d like to learn more about Canada Goose. The brand history was kept short as we would like to focus on the materials they use and their manufacturing process, since there is a lot to go through. First and foremost, the material used in their jackets is either Nylon or Polyester, which come in the form of their very own fabric technologies: Feather-Light US, Strati Dry and Dura-Force. These fabrics are extremely durable to wear and tear, which is why these jackets last for so many years. Apart from that, they are also weather-resistant, albeit not waterproof, which is why Canada Goose jackets are best suited for dry weather, as down is notorious for losing its insulating ability when wet. The down feathers are responsibly sourced from geese that are humanely treated. The sourcing is fully traceable for the entirety of the birds’ lives. Goose down is the better of the two down options, as it provides great loft and warmth without the extra weight and volume. Since a majority of their jackets includes fur trim, this, too, is natural fur from Coyote populations that live in the southern parts of Canada. Their populations are abundant in those areas and sometimes considered as pests due to coming into contact with populated areas. Another jacket design is the raincoat, which is made of 3-Layer Strati Dry fabric, a waterproof, windproof and breathable fabric. On to the manufacturing process, this is something that Canada Goose really takes pride in, as it is a process that consists of 13 steps. All of those steps are meticulously performed, ensuring that every little detail is perfect, from the stitching, to the buttons used and logos embroidered. The Expedition parka is by far the brand’s most popular design. It is their original parka design, which was then later developed into the PBI parka for helping to preserve the polar bears’ natural environment. 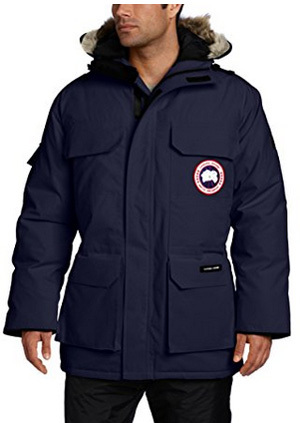 This parka comes in both women’s and men’s versions (check out women’s version on Amazon), and it is insulated with White Duck down. As it is a parka for arctic temperatures, it is extremely warm and designed for protection, which includes the coyote fur trim on the hood. A practical parka, with numerous pockets inside and out. This is a coat that can easily withstand below 0 degrees, regardless if you use Fahrenheit or Celsius. In some of our past comparisons where Canada Goose was featured, we have mentioned the phrase “You get what you pay for” and this brand is the embodiment of that. Their jackets are not the most affordable as the cheapest ones cost more than $300 and it only goes up from there. The parkas, especially, are quite expensive and to some that price might not be justifiable. However, when considering the fact that you only buy a Canada Goose jacket once due to its high quality, it explains why that price is so high. This is a bit tricky to answer when comparing these two brands as one uses exclusively down in their parkas and jackets, whereas the other uses different insulations. Weather-wise, the padded jackets of Jack Wolfskin perform considerably better due to the Texapore fabrics. The designs are also more versatile, providing options for sports and casual wear, not to mention that they are very affordable in comparison to Canada Goose jackets and parkas. In regards to warmth, however, nothing beats Canada Goose. Even when comparing goose-to-goose down insulation in both brands, Canada Goose parkas are impossible to outperform. Which one is better? In terms of durability and warmth, Canada Goose, hands down. But if you want a more affordable jacket that you can wear anytime, regardless of the weather, then Jack Wolfskin provides plenty of options.